1. Plan of an antique building discovered in the excavations made in 1777, on the site of the ancient city of Ocriculum, near the modem Otricoli, in the papal state. It is placed here amongst the basilicas, in consequence of its agreement with the arrangement which Vitruvius, and after him, Palladio, consider to belong to this class of buildings. 2. Church of Sta. Agatha Maggiore at Ravenna, built by the bishop St. Exuperance at the end of the fourth or at the commencement of the fifth century; that is, from 398 to 418. The disposition of the plan is evidently imitated from the ancient basilicas. 3. Church of the Holy Ghost at Ravenna, still more ancient than the preceding; supposed to be of the third century. 4. Plan of the Temple of Jupiter Olympius, called the Temple of the Giants, at Agrigentum, now Girgenti, in Sicily. 5. Plan of the Parthenon at Athens. 6. Church of St. Michael in Foro at Rimini, built in the fifth century. This is one of the most ancient examples of a plan in the form of a Latin cross, which afterwards became so characteristic of the Christian temples. 7. Plan and section of the small antique Temple of Vesta, now Sta. Maria del Sole at Rome. 8. Plan of an ancient octagonal baptistery, built at Ravenna at the time of Theodoric, fifth century, for the use of the Arians. It is now part of the Church of Sta. Maria in Cosmedino. 9. Plan of the church of the Cathedral of Parenzo in Istria, built in 542, with its dependencies, under the empire of Justinian and the pontificate of Pope Vigilius, by the care of Bishop Eufrasius, whose monogram is carved on several capitals of the nave. This monument of the sixth century is remarkable for the many vestiges of ecclesiastical antiquity which it still preserves. A square court, surrounded by porticos, like those of St. Clement at Rome, precedes the church, which is arranged after the manner of the ancient basilicas. The aisles are divided by antique columns of marble and granite, which support arches, the soffits of which are covered with ornaments in stucco as at the Church of St. Paul outside the walls of Rome. The greater part of the pavement is in ancient mosaic; the windows are closed by pierced slabs of marble, as at the antique amphitheater of Pola. Round the apsis terminating the nave is a circular bench in marble for the priests, with the episcopal chair in the centre. The walls of the apsis are inlaid with mother of pearl, porphyry, serpentine, and other precious materials; and the vault is covered with a painting in mosaic, representing in the center the Virgin with the child Jesus; and on the soffit of the arch are twelve medallions of Saints, with that of the Saviour in the center. Near the extremity of the left wing, and near the presbytery, is an ancient triclinium. It is composed of a vestibule, a hall of assembly, furnished with seats for the bishop and his clergy, and a small oratory. At the entrance end of the court is an octagonal baptistery, in front of which is the tower. 10. Monogram of the Bishop of Parenzo, Eufrasius Episcopus, who, in 1542, rebuilt the cathedral. It is carved on several of the imposts of the arches of the nave. 11. Arabian mosque, now the Cathedral of Cordova in Spain; the end of the eighth century. 12. The metropolitan church of St. Mark, Venice, constructed in the tenth century. 13. Plan of the Basilica of St. Zenon at Verona; tenth or eleventh century. 14. Subterranean church or Confession, under the choir of the Church of St. Zenon. 15. Transverse section of the ancient Church of Sta. Scholastica at Sabiaco near Rome; constructed from the tenth to the eleventh centuries. The pointed vault of this church may be considered as the first essay of the Gothic system in Italy. See 35. 16. Longitudinal section of the Cathedral at Modena. 17. Side elevation of the Church of Chiaravalle, between Ancona and Sinigaglia. 18. 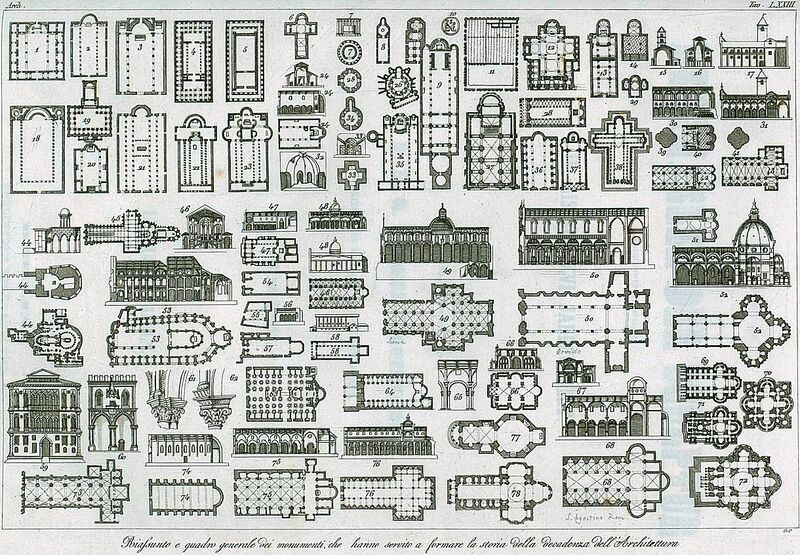 Plan of the Basilica of the ancients, according to Palladio. 19. Plan of the basilica which Vitruvius built at Fano, from his description and the drawing given by Perrault in the translation which he published of this author (edition 1684, pi. xxxix, p. 152). This building in its arrangement had a mixed character; behind the basilica was a temple, at the end of which was the tribunal, which gave to the judgments there pronounced a religious sanction. This arrangement was naturally followed in the construction of the early Christian churches. 20. Church of St. Stephen of the Hungarians, built in Rome near the Church of St. Peter of the Vatican about the end of the eighth century, under Adrian I. In this church may be perceived that dawn of amelioration which appeared at the time of Charlemagne. It resembles in arrangement the churches of St. John of the Porta Latina, of St. Michael in Sassia, of Sta. Cecilia at Rome, and more particularly the Church of the Apostles at Florence,--all churches erected about this period. 21. Plan of the ancient Cathedral of Ravenna, one of the most beautiful of the ancient Christian monuments, and which preserved at the same time the greatest remains of pagan antiquity. Its five aisles, divided by four ranges of columns, presented all the majesty of the ancient temples. The semicircle at the end recalled the tribunal of the ancient basilicas; and in the enclosure formed by the small columns in the centre of the nave was the choir, which, according to the rites of the primitive church, occupied this portion of the building, as we see in the Church of St. Clement, Rome. Vide 16. The Cathedral of Ravenna was often used as a basilica, in the true and ancient acceptation of the word; that is, a tribunal where justice was administered in the name of the sovereign. Under the pontificate of Clement VII judgment was here pronounced, on a difference which had arisen between this pope and Alphonso, duke of Ferrara, the decision of which having been referred to Charles V, he named the Podesta of Ravenna. Unfortunately for art, this edifice was demolished and entirely rebuilt from 1734 to 1745, from the designs of the architect Buonamici de Rimini; and the only proofs we have of its ancient splendor are those preserved by himself in the description which he published of the new cathedral. 22. Plan of the Basilica of St. John Lateran at Rome; this monument of the fourth century, with the accessary buildings by which it is surrounded, form an ensemble the most imposing. The church was at first called Basilica Constantinina, or Basilica Aurea. Constructed after the model of the ancient Roman basilicas, it offered at the same time all the parts necessary for the liturgy of the primitive church; the apsis or tribune, in the center of which was the papal chair; the Confession and beyond the altar where the Pope alone celebrated the holy mysteries, was the presbytery for the clergy, ambons for the reading of the epistle and gospel, and a vestiary for the ecclesiastical hierarchy. Without and around the basilica were various chapels and oratories, and amongst other sacred buildings the baptistery, still preserved and still brilliant with the marbles and precious metals with which it was adomed by the fervour of Constantine. Until the period of the introduction of conclaves, the election of the sovereign pontiff took place in this church, and it is still here that they come after their election to take solemn possession of the pontificate in presence of the clergy and the Roman people. At all times, amongst all people, ancient or modern, in Egypt, in India, in Mexico, the principal places for religious worship have always been and still are accompanied by accessories necessary for its exercise or to augment its splendor; it was the same with this basilica, called Sacro-Sancta, et de omnium urbis et orbis ecclesiarum mater et caput. In a vast enclosure were united, under the name of Patriarchum Lateranense, all the accessary buildings necessary for the residence of an ecclesiastical prince--private oratories, libraries, halls of council, others more vast for holding synods and the meeting of councils, triclinia or dining-halls destined for the agape or sacred repasts, and an elevated tribune from which the pope blessed the faithful. Under the porticos were assembled the penitent, and the travelers attracted by their devotion for the holy places; in the triclinia, instead of the sumptuosity of the pagan festivals, reigned the frugality of the holy repasts, the austerity of the fasts of the religious orders, and regular priests there formed the cortege of the pope in the place of the pretorian guard, whose lodgments were converted into monasteries and cloistered houses which still subsist. Gardens of the useful rather than the luxurious furnished the subsistence of these ecclesiastics, and distributed health in their habitations; in fact, as the cathedral of the Christian world, and the palace of the pope, the Temple of St. John Lateran, traced by the hand of Constantine himself (ejus aream, propriis manibus sarculo admotis, ipse descripsit), augmented, embellished, and restored by a number of emperors and Popes, serving successively as the place of election and habitation for some, and the coronation of others, has always been one of the most imposing monuments which architecture has ever raised in honour of God, and the men specially dedicated to his worship. Ciampini in his treatise De sacris oedificiis a Constantino magno constructis, gives at chap. ii, pl. iii, the general plan of this basilica with all its dependencies, in the state in which they were before a part was demolished to make way for the majestic palace erected by Sixtus V.
23. Plan of the Church of Bethlehem, erected in the fourth century by the Empress Helena, in honor of the Virgin and the Saviour on the spot where he was born, already celebrated by the birth of David. This temple is of beautiful proportion, adorned with a great number of columns, and originally the interior was covered with precious marbles, which were taken away by the Turks to enrich their mosque of Jerusalem. In an enclosure adjoining are all the buildings necessary for the service of the church, lodging for the priests and religious orders and the pilgrims who visit it--cloisters, cells, hospitals, and private oratories; a small church dedicated to St. Catherine built on the spot where St. Jerome worked at the translation of the Bible; the stable or grotto in which Jesus Christ was born, transformed into a subterranean church. The worship is now shared between the Armenians, the Copts, the Syrians, the Greeks, and the Latins, who in turn dispute the possession of this church. It is said to be on the same site where Adrian celebrated the f�tes in honor of Adonis, and that it was to repair this profanation that Helena and Constantine erected this magnificent temple. A letter addressed by this emperor to Macarius, bishop of Jerusalem, exhibits his desire for its sumptuous decoration in all parts. Ut omnia templa . . . . hujus oedificii dignitate superarentur, the Mahometans had soiled it, the Crusades purified it. The city of Jerusalem offers a still more striking example of like vicissitudes. On Mount Moriah, one of the hills of its ancient enclosure, David raised an altar, surrounded by Solomon with the famous temple, one of the wonders of the world; Titus destroyed it; Adrian planted on its site a grove consecrated to Jupiter; Julian endeavoured to reconstruct it; the Saracens under Omar built a mosque; it became a church in the bands of the Crusaders, and they again abandoned it to the Turks, who restored it to the worship of Mahomet. 24. Plan and sections of the Church of St. Nereus and Achilleus at Rome, reconstructed in the seventh century by the Pope Leo III; although of small dimension, the plan offers the arrangement of the ancient basilica. 25. Plan of a small antique edifice near Tivoli, and called the temple de la tosse; it is dedicated to the Virgin, who is here invoked against fever. 26. Church of St. Vitali at Ravenna, constructed in the sixth century by Justinian. 27. Plan of the Church of St. John in Borgo in Pavia, built by the Lombards during the seventh to the eighth centuries. 28. Church of St. Chrysogone in Trastevere at Rome, founded by Constantine. 29. Plan of the Church of St. Catherine at Pola in Istria, in the tenth century. 30. Longitudinal section of the Cathedral of Modena; in the twelfth century. 31. Longitudinal section of the Church of Chiaravalle between Ancona and Sinigaglia; twelfth century. 32. View of the interior of a chapel in the catacombs. 33. Plan and section of an ancient edifice near St. Germano, at the foot of Mount Cassino, on the site of the ancient Casinum. It is constructed with large blocks of hewn stone put together with a great deal of care; it is now known as the Church of the Crucifix. 34. Plan of an ancient circular edifice of beautiful construction, near Salonica, in Macedonia, supposed by Pococke to have served for a church to the primitive Christians, and afterwards converted to a mosque, and again converted to a church dedicated to St. Peter and St. Paul. Mons. Cousinery, formerly consul in the Levant, having examined this building, considered it formerly to have been a temple dedicated to the gods Cabires. 35. Plan of the Church of St. Apollinarius in Classe, three miles from Ravenna, is another example of the union of the form of the temple with the antique basilica. This basilica was erected in 545, by order of Julian, the silversmith, that is, the treasurer of the Emperor Justinian, in honor of St. Apollinarius, disciple of St. Peter, and apostle of Ravenna and Aemilia, now the Romagna. The site of this church, at a distance from the sea, was formerly a port known as the winter station of the Roman fleet, from which is derived its present name of Classe from the Latin Classis. 36. Church of the Apostles at Florence; ninth century. 37. Plan of the Church of St. Peter in Chains, Rome, founded in the fifth century on a part of the Baths of Titus, and reconstructed by Adrian I. in the eighth century. 38. Plan of the Cathedral of Pisa, built in the eleventh century, from the designs of Buschotto, a Greek architect. 39. Plan of one of the pillars of the nave of the Cathedral of Modena; twelfth century. This sort of pillar, square on plan, with half a column on each face, may be seen in several buildings, and is a feature of the Gothic style of this period. 40. Plan of the Confession under the choir of the Cathedral of Modena. 41. Plan of one of the pillars of the Church of Chiaravalle. 42. Ground plan of the Cathedral of Modena; of the twelfth century. 43. Plan of the Church of Chiaravalle. 44. Plan of the Church of the Holy Sepulchre of Jerusalem. The Saracens having destroyed it at the end of the tenth century, the Emperor Constantine Monomachus rebuilt it in the middle of the eleventh at the instance of Pope Leo IX. Plan of the site which encloses the Holy Sepulchre, indicated in small in the center of the rotunda of plan 44. Side elevation of the same. 45. Plan of Westminster Abbey, constructed in the thirteenth century. 46. Transverse section of the Church of Stephen on the Mount at Paris, founded in the thirteenth century, and reconstructed in the sixteenth: it is distinguished by great elegance of design. 47. Plan and longitudinal section of St. Bartelemy all'Isola, built in the tenth century. 48. Plan, side elevation, and longitudinal section of Sta. Maria in Castello at Corneto; of the twelfth century. 49. Plan and longitudinal section of the Cathedral of Siena, commenced in the eleventh century, consecrated in the twelfth, about 1180, by Pope Alexander III, enlarged and embellished during the thirteenth century. This church is one of the most considerable monuments of that period, by the perfect arrangement, the magnificence of the exterior and interior decoration, the richness of the materials, and careful execution of every part. 50. Plan and longitudinal section of the Cathedral of Orvieto, erected in the thirteenth century. 51. Plan of the Church of St. John degli Eremiti at Palermo. This small church, at present annexed to a monastery of Benedictines, founded or rebuilt in the twelfth century by King Roger, is said to be still more ancient, and to have belonged to the ancient monastery of St. Eremete, one of the six which St. Gregory founded in Sicily in the sixth century; nevertheless the form and construction, compared with the other churches of the twelfth century, appear the same, and do not permit the belief in an earlier date. 52. Plan and longitudinal section of Sta. Maria del Fiore, Cathedral of Florence, commenced in the thirteenth century from the designs of Arnolfo di Lapo, the first architect of his time, and terminated in the fifteenth century by Brunelleschi. 53. Plan and longitudinal section of the Church of St. Stephen on the Mount, Paris. Notwithstanding the alterations which this building of the thirteenth century has successively undergone, it is still one of the most remarkable of the Gothic buildings in France. 54. Plan of the Church of Sta. Maria in Capella at Rome, near the Ponte-rotto; of the eleventh century. 55. Plan of the Church of St. Lazarus at Rome; it is attached to an hospital, erected from the eleventh to the twelfth centuries by a Frenchman, to receive the leprous of that nation. 56. Section of the same. 57. Plan of the Church of S. Sisto Vecchio, near the baths of Caracalla at Rome, built in the thirteenth century. 58. Plan and side elevation of the Church of St. Vincent and St. Anastasius, at the Three Fountains near Rome; eighth century. 59. Fa�ade of the Palace Cavalli at Venice, built in the sixteenth century. 60. Fa�ade of the Exchange of Bologna, called the Foro de' Mercanti or the Palazzo della Mercanzia; erected in 1294. 61-62. Details of Arabian architecture of the fourteenth century. 63. Cathedral of Seville in Spain; commenced in 1401 and terminated in 1506. 64. Plan of the Church of St. Mark at Rome, near the Palace of Venice. 65. One division of the nave of Sta. Maria del Popolo, built at Rome in the fifteenth century by order of Sixtus IV, from the design of Baccio Pintelli, Florentine architect. 66. Plan and longitudinal section of an antique edifice in Rome, called the Temple of Peace Basilica of Maxentius/Constantine. 67. Transverse section of the Church of the Trinity de' Monti at Rome, erected in 1494 by order of Charles VIII of France. 68. Plan and longitudinal section of the Church of St. Augustine at Rome, constructed in 1483 by Cardinal Guilliaume d'Estoutevlle, from the designs of Baccio Pintelli. 69. Plan of the Basilica of St. Peter of the Vatican, as designed and commenced by Bramante in 1506. Great changes took place in it after his death. 70. Second plan of Church of St. Peter by Balthazar Peruzzi of Siena, when he was named architect by Leo X in 1520, after the deaths of Julio Sangallo, Friar Joconde, and of Raphael. This plan, in which a Greek cross is substituted for a Latin cross, was like the former never executed, and the idea even would have been lost had not Serlio, disciple of Peruzzi, preserved it. 71. Third plan of the Church of St. Peter, composed by Antonio Sangallo, called the younger or the nephew, who, after the retirement of his uncle Julian, succeeded him as architect of St. Peter. This plan, in which Sangallo wished to re-establish the Latin cross, as imagined by Bramante, was in all respects inferior to the plans of his predecessors. It was therefore abandoned after his death in 1546. 72. Fourth plan by Michael Angelo, who endeavored to restore the Greek cross as designed by Peruzzi. During the seventeen years that this great man occupied the post of architect to the Church of St. Peter, entrusted to him by Paul III after the death of Sangallo, he continued with indefatigable ardor the works necessary for the execution of this plan; but after his death it underwent many changes, more particularly the change from a Greek to a Latin cross by prolonging the front arm, executed by Carlo Maderno under Paul V.
73. Plan of the Church of Sta Maria Novella at Florence, commenced at the end of the thirteenth century, from the designs of Sisto and Ristoro de Campi, Dominican friars. This church is of such happy proportions, that it excited the admiration of Michael Angelo, who called it la sua sposa, la sua dama. 74. Plan and longitudinal section of a small church, partly in ruins, outside the gate of St. Sebastian, Rome, at a place called Cape di bove, near the mausoleum of Cecilia Metella. 75. Plan and longitudinal section of the Church of Sta. Maria sopra Minerva at Rome; constructed in the fourteenth century. The interior exhibits the mixture of the round and pointed arch. 76. Plan and longitudinal section of the Church of the Holy Ghost at Florence; commenced in 1435, from the design of Philip Brunelleschi, principal author of the revival of architecture in the fifteenth century, and terminated in 1481, thifty-seven years after his death. 77. Plan of the Church of Sta. Maria della Pace at Rome, built in the end of the fifteenth century by order of Sixtus IV from the designs of Baccio Pintelli. 78. Plan of the Church of St. Andrew at Mantua; commenced in the fifteenth century, from the designs of Leon Baptista Alberti, one of those who, after Brunelleschi, most contributed to the revival of architecture.